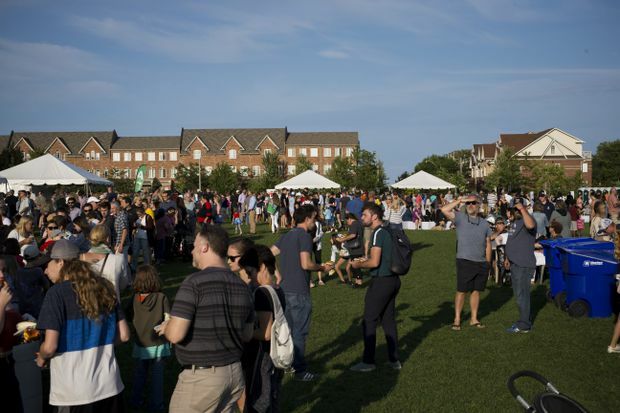 Hundreds from Toronto’s Danforth and Beaches communities gathered on Wednesday for a fundraiser and barbecue to commemorate 18-year-old Reese Fallon at Bob Acton park in Toronto. Hundreds from Toronto’s Danforth and Beaches communities gathered on Wednesday for a fundraiser and barbecue to commemorate 18-year-old Reese Fallon, nearly one month after the mass shooting in Toronto’s Greektown that took her life, and almost a day after another fatal shooting in the area. “We just hope she is remembered for years to come,” event organizer Emma Brown said. The afternoon event at Bob Acton Park raised money for a scholarship fund in Ms. Fallon’s name. It drew a large crowd of community members and supporters, including Mayor John Tory. Ms. Fallon was one of two fatalities in July’s deadly shooting on Danforth Avenue, where a gunman opened fire on restaurants and coffee shops along the busy strip. The second dead victim was 10-year-old Julianna Kozis, and another 13 were injured in the shooting. The gunman, Faisal Hussain, also died that night. Wednesday’s event comes after another shooting on the Danforth earlier in the day, where Danny Morales, 35, of Toronto was killed. Gunfire went off at around 2:30 a.m. near Danforth and Jones Avenues, according to Toronto police spokesperson Jenifferjit Sidhu. One suspect, 27-year-old Jorge Jose, was arrested and charged with second-degree murder. Police continue to search for a second suspect. The shootings on the Danforth have been part of a rising wave of gun violence that has spread across the city. There have been 33 fatal shootings so far this year, according to Toronto police data, compared with 24 during the same period in 2017. The rise in fatalities has prompted city officials to pledge millions to combat gun violence through increased policing and community programming. Just ahead of Mr. Tory’s appearance at Ms. Fallon’s fundraiser, the mayor’s office announced plans to match the Ontario government’s pledge of $25-million over the next four years to fight gun violence if Mr. Tory were to be re-elected in October. “I am committed to keeping Toronto safe,” Mr. Tory said in a news release on Wednesday. One-third of funds would be spent on neighbourhood officers and two-thirds on “recreation spaces and employment supports for young people in neighbourhood improvement areas,” the release said. The $25-million would be in addition to another $30-million approved by city council in July, which will also be spent on hiring more police officers and creating programming for youth, according to the release. At a news conference earlier on Wednesday, Mr. Tory stressed the importance of having all levels of government work together to combat gun violence in the city. “The solution is not going to be magic or instant,” he told reporters. Jessie Silverstein, who lives and works in the Danforth, said more police presence is often the immediate solution when gun violence hits, but “it doesn’t seem to solve the problem.” She agreed with Mr. Tsafatinos, saying emphasis should be put on how guns are being acquired illegally. Ms. Silverstein said the Danforth community is still reeling from last month’s mass shooting. Her co-worker Erin Logan said businesses have been leaning on one another for support. “She was loved by many people, she had a beautiful spirit and she was so passionate about helping other people,” said Ms. Brown, who attended high school with Ms. Fallon’s mother. The scholarship in her name will be used to help students at her high school, Malvern Collegiate Institute. Ms. Fallon was set to study nursing at McMaster University in September.